On my last trip to Australia I heard rumors of the existence of Egyptian hieroglyphics hidden in a strange tunnel-like crevice surrounded with unusual energies. I learned that the site was also a Koori (native aboriginal) site. 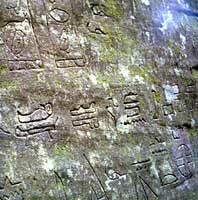 The Koori have not claimed the hieroglyphics as their own, nor does any other native aboriginal group. Aboriginal sites are known for their strange and powerful energies and I heard rumors of unexplainable occurrences occurring inside. The more I heard the more curious I became. Egyptians in Australia? Now that is a question I wanted to get to the bottom of. My Aussi friend Grace and I set out in her little car with new friend Magenta, who was armed with vague directions to the site. We really didn’t know what to expect on our adventure to discover the Egyptians in Australia but were quite excited. We drove one hour north of Sydney to Hunter Valley in New South Wales. Once parked at the side of the road at an unmarked bush track, we hiked about a two miles into the bush. When we came to a curve in the track, I began to feel some shifts in the energy. 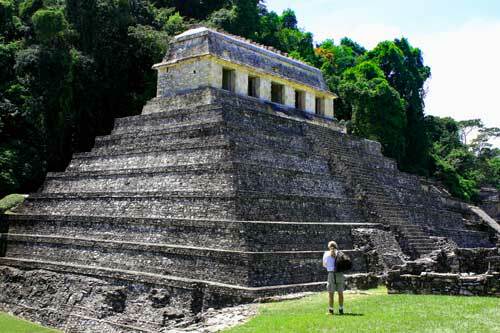 It was similar to the energy I feel when I am hiking in the jungles of the Maya lands just before coming upon a hidden temple ruin. My heart was pounding and without knowing where the site was, I could point to its location. The energy could be felt over a quarter mile away! Even with the strong energy emanating from the site, it was still difficult to find the entrance. The outside of the site was guarded by several older trees and intensely beautiful ferns and greenery. We found a rock crevice and climbed up into a tunnel-like room that seemed to be a huge rock split in two. As soon as we entered the tunnel, we got our first glimpse of the amazing carvings, and our first astounding pulse of the energy. Grace, Magenta and I began to tune into the energy to see what we might pick up. I felt joy, innocence, wisdom, insight, ancient stars, galaxies, universes and androgynous beings from Acturus an Antares. I felt a blending of cultures yet all connected to one source. I felt a peace but also a warning. I took at least three rolls of film. . . but the camera was acting funny. Hmmm. . . 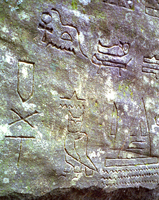 The two 20-foot long walls of a cave-like structure were heavily decorated by Egyptian-like hieroglyphics and other numerous symbols, many easily identifiable, others not. 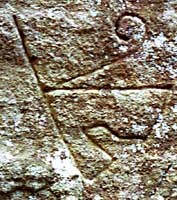 Egyptian-like phonic script, including complete cartouche panels naming the reigning Pharaoh Khufu, or Cheops circa 2600 BC were there. The carvings reached up to over ten feet high. I guessed there might be as many as 250 separate carvings. Time had weathered many of the hieroglyphics completely off the south wall, while the north wall was still very clear. 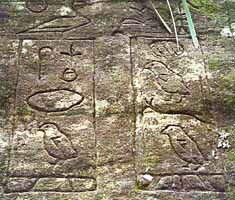 Wonderful carvings of birds, the eyes of Horus, crosses, circles, boats, Mayan symbols, Celtic symbols and even examples of early Hebrew carvings covered the walls. Some of the carvings looked quite old and others seemed to have been added later. It was a strange mixture of ancient people and times. 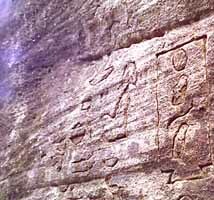 Were these ancient ones here exploring the world in early days of Egypt, maybe in search of the lost motherland? 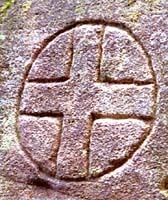 One particular carving that got my attention was an ancient cross inside a circle that has been associated with the Pacific motherland in James Churchward's books. I have been wearing this symbol around my neck for over 15 years. One of the best of the carvings was under a portion of a rock roof. This is where we discovered Anubis. 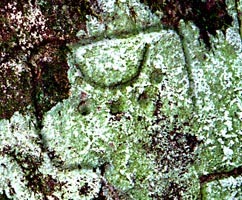 It was clear it had been examined as the lichen had been cleaned off this part of the rock. Anubis is considered the guardian of the doorways to the underworlds, an opener of the ways, and is associated with the dog star Sirius. 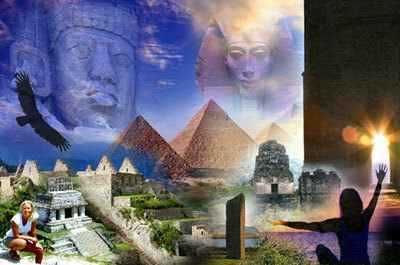 Egyptians considered Sirius a portal or gateway to other dimensions. One Australian researcher and channel named Robin Franklin channeled Anubis and discovered that Anubis was the guardian of the place and protected it for many thousands of years. He said the writing came from people from the kingdom of Kam, which we now call Egypt. These ones were survivors of Mu Lemuria and were under the guidance of those from the stars. Franklin stated in an article he wrote that a message from Anubis stated that the hieroglyphics say, "growth comes from Love and destruction comes from hate. If man does not change his heart the world could be destroyed." Now this is by no means a great revelation. We all know this one. . . But to hear it again in such an obscure place just anchored the message deeper into my heart. 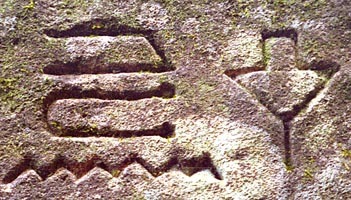 Another interpretation by researcher Paul White in an article entitled, "In search of Ancient Secrets 1994" suggests that the carvings may be a sequence that could describe the classic shamanic path of enlightenment, or maybe a prophecy addressing people of a future time, who faced possible destruction if they didn't follow the path of the One True God. Even those not considering themselves very psychic can feel strong energy in this site, especially when the rock walls are touched. Some think that the strong energy comes from the site being one huge energy ley line that radiates out from a central New South Wales power called, "The meeting of the tribes." Paul White was also aware of the persistent legends in Australia that tell tales of strange and magical happenings, power places on grid lines. Energy grids spread like a spiders web across Australia, creating special energy in cross roads. Some researcher even suggest that the crevice could even be a time tunnel to Peru or other power places. The aborigine speak of instantaneous travel along "song lines" between power places. Could this site be a time travel site? The next day when I went to develop my film, I discovered that all three rolls of film were quite unusable. It was as if the carvings hid themselves from the camera. You could hardly make out the carving. I was disappointed to say the least. We were going to have to make another trip out to the site. On our second trip out to the site with new film in hand, I was determined to get some good photos of these carvings before I had to fly home. But this trip also had its problems and was also interrupted with weird events. I began to photograph the site once again and my camera began to freeze up. I managed to get two rolls of film shot but I was only able to photograph only part of the site before my camera decided to die altogether. After I knew the camera was not going to respond any further, Grace and I climbed up to the top of the site to a huge whale-shaped rock. This is a very sacred place to the aboriginal people of the area. We knew of a burial ground just further up the hill and knew better than to go visit. It seemed like we were already on shaky ground with the ancestors and didn't want any more trouble. We sat and meditated for awhile and received permission to create a flower essence atop this great whale rock. 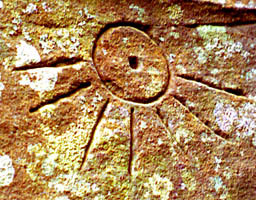 Now did the Egyptians come to Australia or was it people from the stars? This answer still eludes us today. But the evidence is mounting to suggest that there is some connection between Australia and Egypt. Over a period of a few years, A man named Paul White discovered evidence of other Egyptian artifacts in Australia, ranging from a statue of an Egyptian God Thoth near a pyramidal hill in Gimpie, south east Queensland, two cartouches of the Egyptian Pharaoh Ramses, found in Arnhem Land and northern Queensland early in the last century and an Egyptian amulet found in Kyogle in northern South Wales that dates at 5000 years by the Department of Mines. Remember the problem I had with my camera? It gets even more bizarre. . . Remember I could not take photos at the aboriginal site without my camera failing? When I left the site after the first visit I shot a roll of film with no problems. Between the two trips to the Egyptian site the camera was fine. The second trip to the site is when the camera died for good, but not before I got some good photos. When I got home to the states, I took the camera to a repair shop. I got the camera fixed and was working fine. I began to notice some strange light in the photos I was taking. . .. When I looked back on the photos of the aboriginal site in Australia, and there it was. . . in the tunnel where no possible lens flares of any kind could be possible there were unusual lights in the photos above some of the carvings. It was like my camera picked up light or energy that it didn’t before. And taking it to a Camera dealer didn’t stop the problem either. I don’t know what this means… Just another odd occurrence in my already strange life that I question. I thought some of you out there might have some input on these. My VERY OLD Directions to get there: 1 Hwy north from Sydney, exit 83 to Gosford. Turn right (near Kariong) at Woy Woy Rd. Then it's about 1.5 ks from this turn off. Just after you pass the suburbs/houses, you will hit bush, and a dirt turn off on the left. Park here on the side of the road. There is a metal gate. Start walking down this dirt road, maybe a kilometer (half mile). Turn left at the first left, keep going till there is another left. Just stay on the road, till you pass the Grandmother tree guardian on the left, (make sure to give her a big hug). And then walk towards Grandfather tree on the right. The one on the right is where the trail to the hieroglyphics are. You have to climb through the rocks to find them. Aluna Joy Yaxkin Copyright 2002. www.AlunaJoy.com 1995-2016 - Unauthorized use and/or duplication of any material on our web site without express and written permission from its author and/or owner is strictly prohibited. Violators will be reported to the DMCA. Please respect our work, that we intend to continue to offer to you freely. RE-POSTING GUIDELINES: We appreciate your desire to share our messages and posts on your own web sites, Facebook pages, blogs, etc..., but for many specific reasons, our messages, posts and images need to remain solely on www.alunajoy.com. We encourage, and give you permission to place a WEB LINK to our posts anywhere you like. Thank you for your great support. We would not be able to continue this work if it were not for you. We send you awesome radiant blessings today and for the beautiful future that we are co-creating together. If you are feeling appreciation for our work please consider sending us a LOVE DONATION, or better yet, send an easy re-occurring donation. This is not required . . . but donations help keep our messages coming to you. Donations also help us pay for a private server needed to send bulk e-mails, additional bandwidth for video, the helpers that put our Free Newsletter into your in-box, as well supporting our other service programs. We want to maintain this free newsletter offering as long as we can. We realize that is becoming quite rare these days to offer this much time and effort freely, but we also trust that Spirit and our like minded community will cover our expenses. Do you shop on AMAZON? You can send us a LOVE DONATION for our service work and newsletter and not spend a extra dime, every time you shop at Amazon all year long! Donating to our work is as easy as bookmarking our unique amazon link! We have a partnership with AMAZON which donates 2-5% of any sales made by any shopper entering Amazon through our unique link. Whether you're buying a book or a an Amazon any time during the year. No matter where you go in Amazon from there on, your purchases provide a bit of support for our free Newsletter and our other service programs. Thank you for supporting our work! Understanding the Power of Creation from a Higher Perspective.